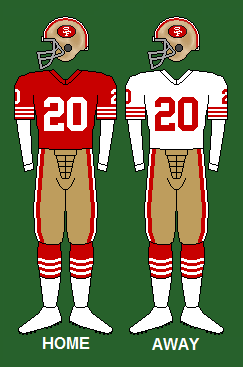 49ers running back Roger Craig became the first player in NFL history to record both 1,000 rushing yards and 1,000 receiving yards in the same season. Craig rushed for 1,050 yards, and had 1,016 receiving yards. ↑ "1985 NFL Pro Bowlers". Pro-Football-Reference.com. ↑ "1985 NFL All-Pros". Pro-Football-Reference.com. ↑ Pro-Football-Reference.com: Marshall Faulk is the only other player to log 1,000 yards rushing and 1,000 yards receiving in the same season. He did so with the St. Louis Rams in 1999.